Astronomers have found evidence for two intermediate-mass black holes in the M82 galaxy. It has been a mystery of whether black holes exist with masses in between the stellar mass and supermassive categories. Evidence suggests that these two objects avoided falling into the giant black hole at the center of M82. It is possible these intermediate-mass black holes are examples of seeds required for the growth of supermassive black holes. This composite image of the nearby starburst galaxy M82 shows Chandra X-ray Observatory data in blue, optical data from the Hubble Space Telescope in green and orange, and infrared data from the Spitzer Space Telescope in red. The pullout is a Chandra image that shows the central region of the galaxy and contains two bright X-ray sources -- identified in a labeled version, roll your mouse over the image to view -- of special interest. New studies with Chandra and ESA's XMM-Newton show that these two sources may be intermediate-mass black holes, with masses in between those of the stellar-mass and supermassive variety. These "survivor" black holes avoided falling into the center of the galaxy and could be examples of the seeds required for the growth of supermassive black holes in galaxies, including the one in the Milky Way. This is the first case where good evidence for more than one mid-sized black hole exists in a single galaxy. The evidence comes from how their X-ray emission varies over time and analysis of their X-ray brightness and spectra, i.e., the distribution of X-rays with energy. One of the black holes (called "X42.3+59") is located at a projected distance of 290 light years from the center of M82 (labeled with an "x") and its mass is estimated to be between 12,000 and 43,000 times the mass of the Sun. At this close distance, if the black hole was born at the same time as the galaxy and its mass was more than about 30,000 solar masses, it likely would have been pulled into the center of the galaxy. That is, it may have just escaped falling into the supermassive black hole that is presumably located in the center of M82. The second black hole (called "X41.4+60") is located 600 light years in projection away from the center of M82. The best model for this M82 black hole has a mass between 200 and 800 times that of the Sun, and tilted at an angle between 60 and 80 degrees, meaning that the disk is viewed almost side-on. However, because of relativistic effects for a rapidly spinning black hole with this mass, a disk viewed at a high inclination is almost as bright as one viewed at a low inclination (i.e., face-on). These results are interesting because they may help address the mystery of how supermassive black holes in the centers of galaxies form. M82 is located about 12 million light years from Earth and is the nearest place to us where the conditions are similar to those in the early Universe, with lots of stars forming. Multiple observations of M82 have been made with Chandra beginning soon after launch. 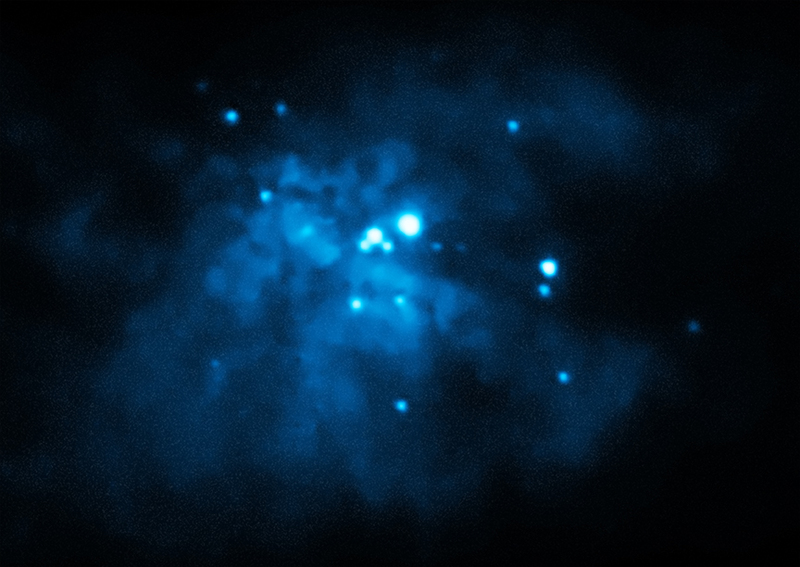 The Chandra data shown here were not used in the new research because the X-ray sources are so bright that some distortion is introduced into the X-ray spectra. To combat this, the pointing of Chandra is changed so that images of the sources are deliberately blurred, producing fewer counts in each pixel. Scale Inset image is 1.8 arcmin across (about 6,300 light years across). Coordinates (J2000) RA 09h 55m 50.70s | Dec +69° 40´ 37.00"
Great contribution. Wish more and more pix and detailed analysis of Milky Way is posted. The information on this site was very useful to me. I am currently writing a text book titled Unique Physics of Light and Astronomy. I am writing a Chapter Mystery of Black holes. I'll mention you data in my book. I am at present watching the Teaching company DVDs "Understanding the Universe with Alex Filippenko 96" lectures, and in one set of the lectures he talked about Black Holes in galaxies and I learned so much. He did not show this particular photo in his lectures. A very interesting view of M81 and something new to me about Black Holes. Thanks so much for this article and photo Chandra team. Would you please address the reasons why these intermediate mass black holes formed. Are there binary or trinary etc. black hole systems? 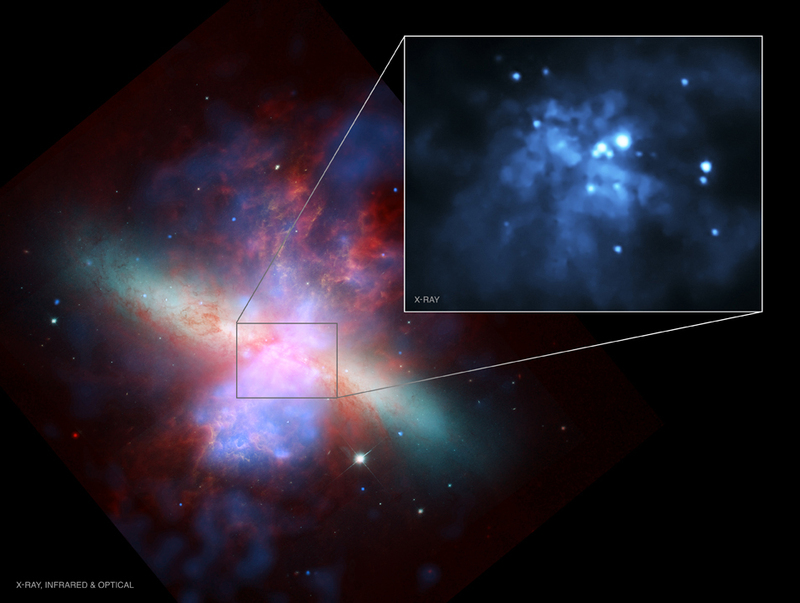 The central region of the M82 galaxy contains two bright X-ray sources that may be intermediate-mass black holes. About 12 million light years from Earth. X-rays from Chandra were overlaid on optical data from Hubble and infrared data from Spitzer. About 6,300 light years across. X-rays are blue, the optical data are green and orange, and the infrared data are red. In the constellation Ursa Major ("big bear") visible in the Northern Hemisphere.